The Saltwater Crocodile is the largest living reptile. They have a body length between 5 and 7 m (16 - 23 ft) and they weigh between 400 and 700 Kgs (882 - 1,543 lbs), with males being much larger than females. They are grey or brown in colour and they have a broad, heavy set body with a large head. Their jaws are strong and they have short, strong limbs. They have ridges that run from their eyes to their nose and this is particularly prominent in older animals. Saltwater Crocodiles have a valve that seals off the mouth from the throat and this enables them to open their mouth while they are under water. However, they cannot eat their prey underwater as swallowing would allow water into their throat so they either have to drag their prey onto land or raise their head above the water to swallow. They are capable of explosive bursts both on land and in the water but they are generally very lethargic with enables them to go for months with out feeding. Their legs are held flat against their body or slightly out to the side while they swim because all of their propulsion comes from their tail. They can also leap out of the water from a stationary position at the water's surface. It is more effective in deeper water as the crocodile can position its body better in order to get maximum propulsion from its tail. 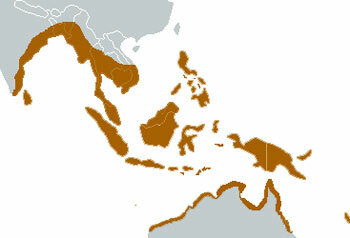 Saltwater Crocodiles are found in south east Asia and Northern Australia. During the wet season they spend their time in fresh water swamps and rivers but during the dry season they move down stream to estuaries and can sometimes be seen in the open sea. They are territorial and dominant males tend to occupy the most eligible areas of rivers and freshwater streams. Saltwater Crocodiles mainly feed upon mammals, birds and fish, although they are not fussy eaters and they will eat anything that would come to the edge of the water. They are ambush predators and they prefer to hunt at night. They wait for their prey to get close to the edge of the water then they strike without warning. They grab the animal and drag it into the water. Most animals are killed by the immense jaw pressure exerted by the crocodile but some are drowned. Their most deadly attack is known as the "death roll" where the crocodile grabs the animal and rolls powerfully. 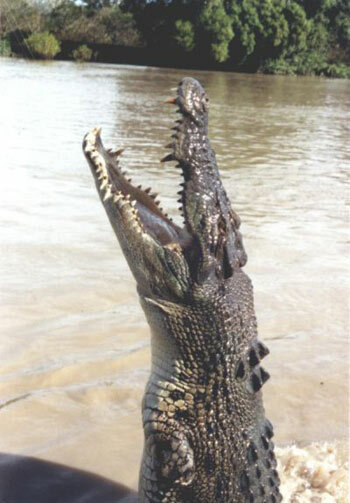 It is designed to throw any large prey off balance which enables the crocodile to drag them into the water more easily. The "death roll" is also used as a method of tearing apart large prey so the crocodile can consume it. 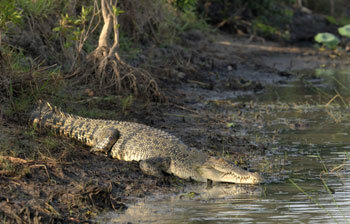 Saltwater Crocodiles mate in the water and females lay 40 - 60 eggs in a mound of vegetation on the river bank. The female will guard the eggs for approximately 100 days and upon hatching the young crocodiles will squeal and their mother will dig them out and carry them into the water. For the next 8 months the young crocodiles will live in creche groups that are watched over by the adults. Humans are the main predators of Saltwater Crocodiles. 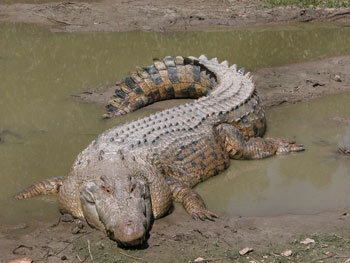 Saltwater Crocodiles are the largest living crocodile - in fact they are the largest living reptile. The Saltwater Crocodile is considered the most dangerous crocodilian to humans as they are mainly responsible for attacks on humans. Their name, Crocodylus Porosus, means pored crocodile. Saltwater Crocodiles have fewer scutes on their underside than other crocodiles and therefore their hide is valued higher than that of other crocodilians.